Well, that was fast. After former Microsoft CEO Steve Ballmer was reported to be in the mix for the Los Angeles Clippers yesterday, it appears that he’s going to walk away the newest NBA owner, paying a reported $2 billion for the franchise. While the sale has not been approved by the NBA, all signs indicate that will be the least troublesome bit of this entire process, which saw the NBA reach a head on what can be charitably called ‘The Donald Sterling Problem,’ a thirty-year pattern of racism, discrimination, and embarrassment both inside the NBA and out that reached a new level of publicity with the release of recordings in which Sterling espoused a variation on the Plantation Politics and asked his mistress/personal assistant/hanger-on not to bring black people to Clippers games. The fact is that the Clippers found success in spite of the Sterling ownership, not because of it. With Ballmer, the Clippers players, employees,and owners can finally look forward to, you know, enjoying who they work for. Based on the reaction from around the sports universe, that’s an opinion that’s shared by many spectators as well. 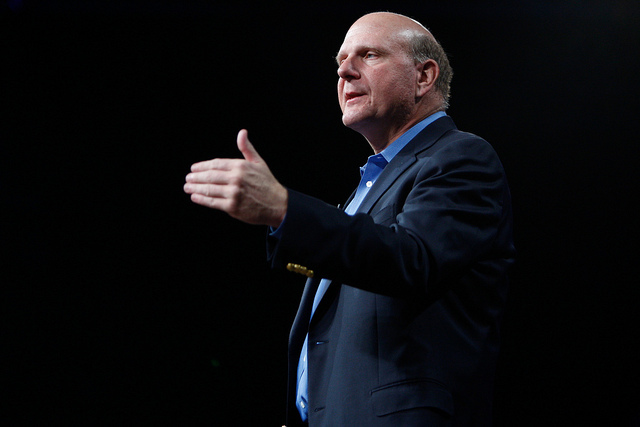 Here are the seven best responses to the Ballmer sale. That’s right — Steve Ballmer was the guy who invented Clippy. If you’re old enough to remember Clippy, you’re undoubtedly experiencing some long-dormant emotions surging to the front, as the widely hated Microsoft Office Assistant just made the first appearance in your psyche for the first time in forever. Probably. Unless you find yourself thinking of Clippy a lot. We’ve got to wonder if Ballmer was in the middle of signing the paper work when that hellish demon of workflow inefficiency popped up to ask him if he was writing a letter. Clippy may have also suggested that Ballmer rephrase that. Ralph Cindrich is currently a sports agent, representing NFL players. He’s also a former NFL Player, rostered for three teams during a short stint in the ’70s. He is, by all accounts, a fairly fantastic agent — he famously worked a clause into Will Wolford’s contract that guaranteed that Wolford would be the highest paid player on the his team — but apparently he doesn’t understand the difference between private property in the general sense and how private property works in regards to franchises. The NBA can vote Sterling out of the league, and/or dissolve the Clippers franchise, at any time. That’s how this gig works. One of the obligations to the league that comes with being part of a franchise — that each owner is bound to work towards the betterment of the organization. Sterling pretty obviously violated that, even if the recording was leaked (We doubt it was covertly taped, since it’s fairly clear that Sterling knew he was being recorded as you listen to them). Also, technically, if we really were ‘going Commie in the USA’, there wouldn’t have been a sale, it would’ve just been a reallocation. But that’s a detail. Kind of like how ‘Steriling’ isn’t how you spell Sterling. But Cindrich’s point is at least harbored in some kind of reality — Sterling has made claims that he’s going to fight the sale, and while Ballmer is definitely going to take over the team, it could be a while before we’ve seen the last of DTS — something that can’t be said for Scott Rochelle, another sports agent, who tweeted this: “Donald Sterling still owes the NBA $2.5 Million, clearly he has the means to pay, but does he feel compelled to do so? #NotOverYet.” This probably needs to be debunked right now — Sterling doesn’t have to pay the fine at all, since the NBA can just withhold it from him. He’ll be out his money one way or the other. This one’s just notable because of the quotes around “experts.” Herman Cain, who made a brief foray into the public eye with a semi-serious 2012 presidential bid, hit the nail on the head for some NBA observers who spend too much time looking for Big Brother wherever they can. Wondering about whether or not Sterling, who was deemed mentally unfit to make decisions relating to the Sterling Family Trust (the organization that officially owns the team, split evenly between Donald and Shelly Sterling), is some sort of ‘fall guy’ is like wondering about whether or not Professor Moriarty really taught lessons. That is to say, it’s beside the point. There’s also the possibility that it was Shelly Sterling’s hand behind the ‘experts’ rather than some nefarious government-y meddling. In case you haven’t heard the tapes, somehow, the first one is below.